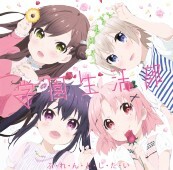 This CD contains the opening song to the TV anime Gakkou Gurashi. Songs by the seiyuu group Gakuen Seikatsubu (学園生活部), made up of Minase Inori (水瀬いのり), Ozawa Ari (小澤亜李), Ichimichi Mao, Takahashi Rie (高橋李依). The lyrics in the booklet has the singers of each line marked by their character names.